I wanted to include as many of his power-ups as possible, but the main rule I had to follow was that I couldn’t include things that actually transform Mario himself rather that just changing his wardrobe, like the Boo mushroom from Mario Galaxy that turns him into a ghost. So I’ve mentally prepared myself for the barrage of ‘OMG WHY DIDNT U INCLUDE THIS 1 ON THERE U R DUM. 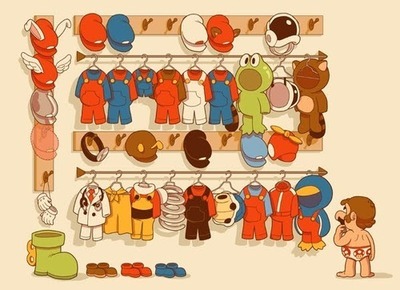 via “Mario’s Closet” by Glen Brogan. I hope he picks… – Tiny Cartridge – Nintendo DS & DSi News, Media, Videos, Imports, Homebrew, & Retro Junk.